Are you struggling to manage the comments on your blog? Looking for a tool to help? The right tool can make managing comments easier and faster, allowing you to focus on creating great content that sparks conversation. In this article, you’ll discover four tools to help you moderate blog comments more effectively. 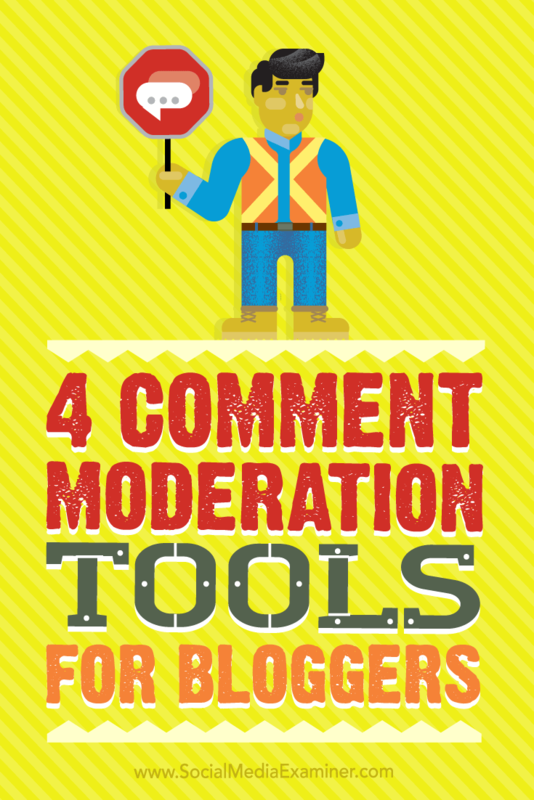 Discover four comment moderation tools for bloggers. Disqus is one of the most well-known and most-used commenting tools available today. It offers a feature-rich commenting system that’s designed to encourage engagement, while making it easy to moderate and analyze the comments. Disqus encourages discussion, while making it easier for moderators to sort through and analyze comments. You can install this comment system on your blog with a snippet of drop-in code or via a plugin. Not only is this tool meant to encourage commenting, but its format and notification system are also structured with a community feel. 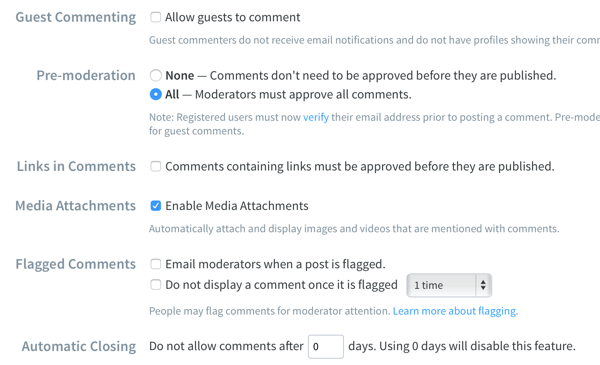 You can adjust your moderation settings to automatically allow or require moderation for different types of comments. Disqus is perfect for nearly every audience and blog, as it works on both desktop and mobile (including Google AMP) and supports more than 70 different languages. It will automatically adapt to your blog’s color scheme, though you can change and customize the color scheme of the comments section if you want. You can moderate comments through the moderation dashboard, which makes the process faster and easier. Most importantly, Disqus makes comment moderation incredibly easy, both through a dashboard and email, which allows you to moderate from wherever you are. Businesses that use Disqus can moderate comments from a single dashboard. The dashboard is also where you can create user ban lists, word filters, spam controls, and comments’ reputations. A large number of blogs use a Facebook plugin called Facebook Comments, which allows users to leave comments that are linked to their Facebook profiles. Rather than having to create a login for the commenting system (as users are prompted to do with Disqus), they can log in and leave comments with their Facebook profile. Because most users are already logged into Facebook, this is a great way to quickly move users through the login process to get them commenting. Using this plugin makes it easier for users to leave comments, as many are already logged into their Facebook accounts. Moderators can organize comments by time posted or by posts with the most engagement. The comments section itself isn’t as customizable as some of the other tools on this list, but it offers the choice of a light or dark color scheme and the layout automatically adjusts for mobile devices. 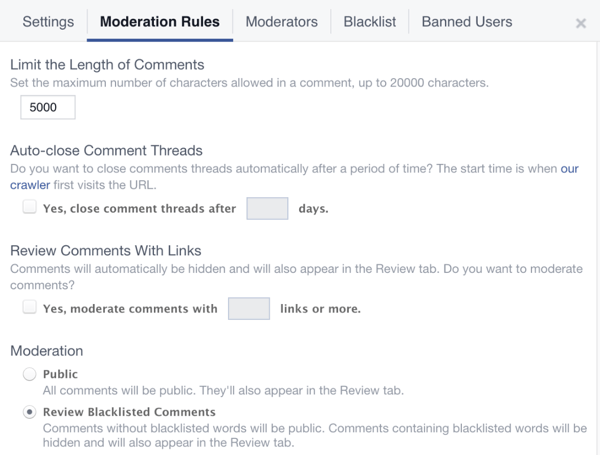 This tool’s customizable moderation rules automatically apply to your comment sections. You can moderate comments through the Facebook app or through a browser, and apply bulk actions to comments to make the process go just a little faster. Comments that are flagged by Facebook or other users (like those that are offensive or profane) are placed in a separate Flagged folder. Before you review them, you can decide if you want these comments to be public or hidden. The tool also lets you assign specific comments to different team members, which is a great feature if moderation is a team effort. Facebook has some essential moderation features built in, like the ability to assign comments to certain team members or automatically flag questionable content. Many businesses love Facebook Comments. The biggest downside is that it requires users to have a Facebook account to leave comments, and you might lose some engagement from those who either don’t have an account or don’t want to share their thoughts with a link to their profile attached. IntenseDebate works on a large number of website platforms, including WordPress, Tumblr, and Blogger. 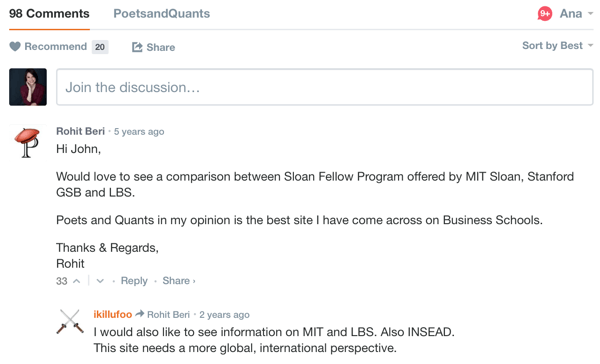 Like Disqus, commenters can reply to each other with nested replies, encouraging discussion. This (aided by email alerts of new comments) keeps users coming back to your page, increasing engagement and retention. As a comment moderator, the tool lets you both moderate and respond to comments through email. In addition, you have the option to assign multiple administrators to one site, which is a great option if you have a team working on moderation. 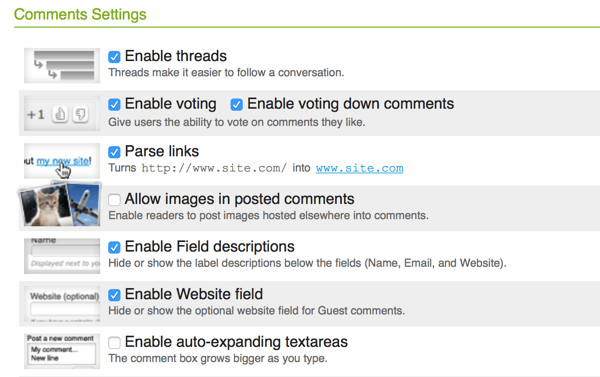 IntenseDebate allows you to adjust comment settings to make moderation even easier. IntenseDebate’s moderation and blacklisting features allow you to filter, search, and/or auto-delete comments by keyword, IP address, or email address. You can ban specific users from posting if need be, and this comment system uses the highly effective Akismet filter to keep spam off of your blog. Comments are also backed up on both IntenseDebate’s server and WordPress, so if you ever decide to get rid of their system, you don’t lose all of the comments. The moderation dashboard makes it easy to approve, delete, or send comments to spam. IntenseDebate also allows for social commenting, increasing social opportunities. Users can log in and post comments on your blog with Facebook Connect, and users logged in with Twitter have the option of tweeting at the same time they comment, driving new traffic to your blog. Social logins can increase commenting and also drive new traffic to your blog. Along with user comments, Livefyre’s products strongly emphasize driving sales and engagement through user-generated content (UGC). 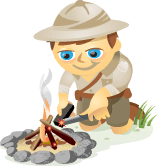 Livefyre focuses on generating conversations that keep users around longer. This approach ideally provides opportunities to monetize content in the process. 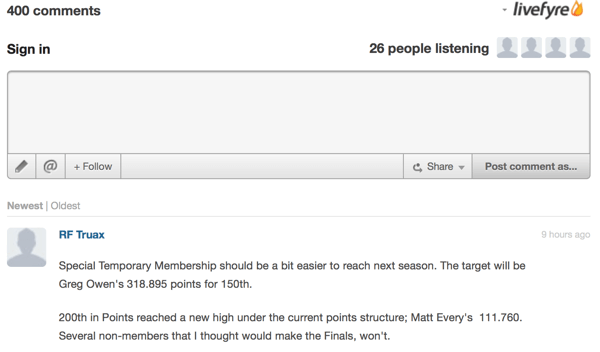 Livefyre’s “people listening” feature is a great way to encourage more comments and discussion. 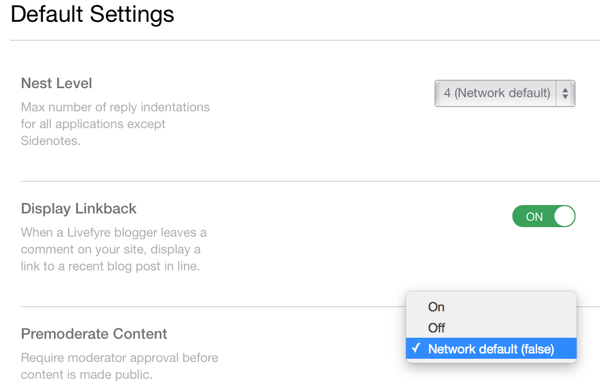 Livefyre has a lot of customizable settings that do a chunk of the moderation work automatically for you. These settings give you the option to moderate comments before they’re public, allow users to revise their comments, let guests comment, and display link-backs in the comments section. Plus, like some of the other tools on the list, Livefyre lets you create ban lists that prevent specific users from commenting on your blog. This platform’s customizable settings allow the system to do more of the moderation for you. My favorite feature of Livefyre is the rules settings. For example, if five users flag a piece of content as spam since its approval, the comment will automatically be trashed. This is also true for comments that are flagged by the network’s profanity filter (which can be turned off), and content that is flagged as offensive by five users. Once all of the comments are automatically processed, you’ll be able to move much faster through Livefyre’s moderation queue (ModQ) to approve the comments you want to share on your blog. Livefyre’s rules will automatically flag and remove content that you want to keep off your blog but that would probably make it past a spam filter. As you build a following on your blog, you’ll likely start to see increases in engagement and comments on your posts. Moderating those comments becomes an important task because you want to filter out comments with inflammatory or inappropriate content, spam, or certain cases of obvious self-promotion. The reason is simple: these comments can reflect poorly on the overall quality of your blog and your business, and can even result in your readers not trusting the safety or security of your blog. For those who aren’t interested in feature-dense moderating software like the tools discussed above and just want to filter out the ridiculous amounts of spam we all get, Akismet is an incredible spam filter available on WordPress. It will send all spam comments directly to a separate folder so you don’t have to sort through them unless you want to. No matter which option you choose, just remember comment moderation tools make moderating easier and faster, allowing you to focus more on creating great content. What do you think? Do you use a third-party tool to moderate comments on your blog? Which tools would you try? Share your thoughts and experience in the comments below! 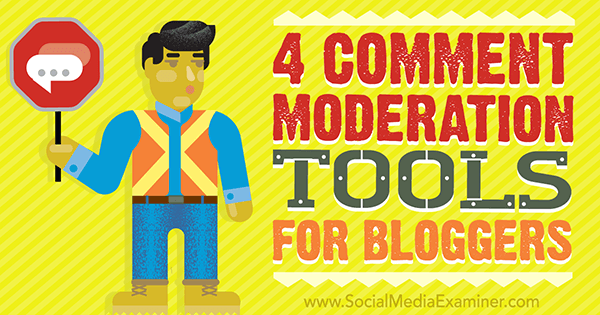 Tips on four tools bloggers can use for easier and faster comment moderation.